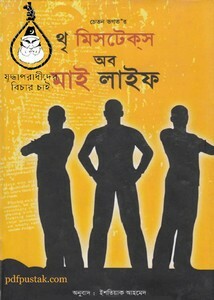 Three Mistakes of my Life by Chetan Bhagat Bangla Translated book pdf. He is a famous writer and "Three Idiots" is his famous novel, the author - Chetan Bhagat is Indian but does not write in Hindi. His books are written in English, his third book, "Three 3 Mistakes of my Life" it is written in English and translated into Bangla by Ishtiyak Ahamed. Pre-speech of the book is not like another ordinary book. Read the extraordinary story, the author Chetan Bhagat story began with the context of an e-mail. The Bangla translated book has 237 pages.